I got the idea for this when I glanced up at my pantry shelf one day. I made and canned some apple pie filling last year and really needed to use it up because the shelf life is only about a year. 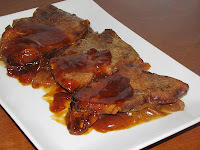 I'm always looking for ways to cook non-dried out pork chops and the crock pot seemed like the perfect tool for that. In my opinion, applesauce is a pork chop's best friend so why not go with that idea but throw some pie spices into the mix! The spices infused the pork chops and left them with the subtle hint of cinnamon and nutmeg while the apples were the perfect compliment. I felt like it needed a little something else though so I added the onion to offset some of the sweetness of the pie filling. They brought about a nice subtle flavor. After cooking in the crock pot all day, I had some super moist pork chops, some apple pie filling that had caramelized nicely, and the wonderful aroma of cinnamon and apples throughout my house. 1. Spray crock pot with non-stick spray. 2. Pour apple pie filling in, reserving 1 cup. 3. Layer onion rings over apple pie filling. 4. Place pork chops on top of onions. Season with salt and pepper. 5. Cook on low for 6-7 hours or high for 3-4 hours. 6. Heat remaining pie filling and serve with pork chops.